Michelle Obama is optimistic in the face of what she calls a “dark chapter” in American politics. 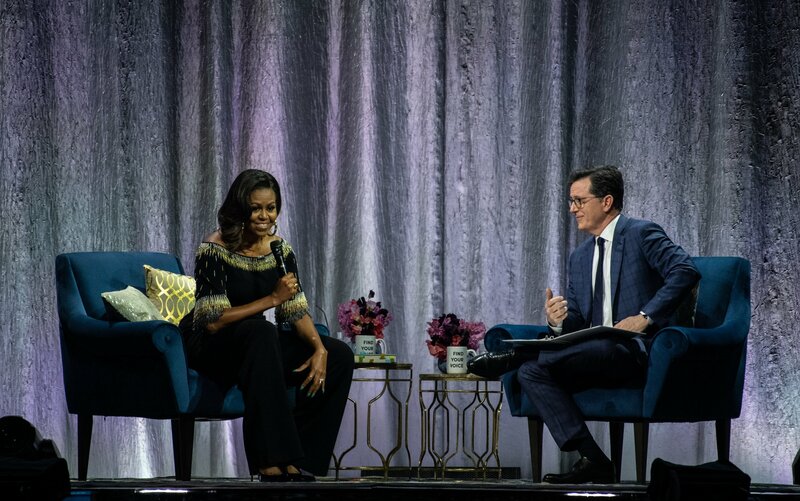 Speaking with comedian Stephen Colbert at London’s O2 Arena on Sunday, she asked the audience to remember that the U.S. voted for her husband twice. The former first lady was speaking at a promotional event for her memoir, Becoming, which details her journey from a child growing up in Chicago’s South Side through her time in the White House. This was the former first lady’s second promotional appearance in London for her book. She previously spoke with acclaimed writer and activist Chimamanda Ngozi Adichie at a sell-out event at the city’s Southbank Center. At the December event, Obama spoke frankly about her battles with low self-esteem. “I still have a little impostor syndrome, it never goes away, that you're actually listening to me,” she told an audience in December. "It doesn't go away, that feeling that you shouldn't take me that seriously. What do I know? I share that with you because we all have doubts in our abilities, about our power and what that power is.